On May 17 2013, senior researcher HAYAKAWA Noriko of the Center for Conservation Science and Restoration Techniques and NISHIMOTO Tomoyuki and OKURA Takanori of Hayashibara Co., Ltd. were awarded the 63rd Industrial Technology Award by the Osaka Industrial Research Association for their joint study titled “Adhesives for Restoration of Cultural Properties:Development of Furunori (aged paste)-like Polysaccharides.” The Industrial Technology Award is given by the Osaka Industrial Research Association to recognize the achievements of individuals who have advanced or improved industrial research,inventions (leading to or potentially leading to industrial applications) or technologies currently in use. 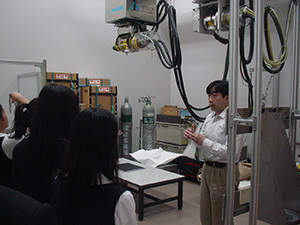 On May 21, five visitors from Okazaki Junior High School affiliated to Aichi University of Education visited the Institute in order to view work involved in the conservation and restoration of cultural properties. They toured the Library of the Department of Art Research, Archives, and Information Systems, the Performing Arts Studio of the Department of Intangible Cultural Heritage, the Conservation Laboratory and the Radiography Laboratory of the Center for Conservation Science and Restoration Techniques, and the Japan Center for International Cooperation in Conservation. The Taima Mandala is a pictorial depiction of Japanese Pure Land Buddhism showing primarily the Pure Land Paradise of Amida based on the Commentary on the Meditation Sutra by the monk Shandao from Tang Dynasty China. The work has been passed down by the Taima-dera Temple in Nara, leading to its name. The work is massive, extending more than 4 meters in width and height. Scenes in the mandala are depicted by weaving, i.e. figured brocade, rather than pictures painted on silk canvas, as was normally the case. A recent view has posited that the work may have been produced in Tang Dynasty China in the 8th century. Nevertheless, the work has unquestionably deteriorated over a span of 1200–1300 years. The state and extent of the original figured brocade that remained had not been fully ascertained. The Institute’s Department of Art Research, Archives, and Information Systems conducted a joint research project on the mandala with the Nara National Museum last year when the museum hosted a special exhibition entitled Taima-dera Temple. The Taima Mandala was kept affixed to the back of a board in a miniature shrine atop a dais in the mandala hall of Taima-dera Temple. However, the mandala had severely deteriorated by the Edo Period, so paper was placed on top, water was applied, and the fabric of the mandala was detached to that it could be refashioned into a hanging scroll. This hanging scroll was studied last December. 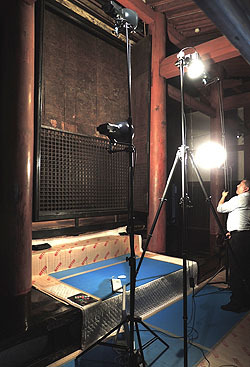 Some of the fabric remaining on paper that was used to detach the mandala during the Edo Period has been kept by Saikou Temple in Kyoto as the Mandala “Imprint on Paper.” The remaining woven fabric that has not peeled away from its original backing, known as the “Backboard” Mandala, has survived. Together with the Nara National Museum, SHIRONO Seiji and SARAI Mai performed high-resolution imaging of the Mandala “Imprint on Paper” at the Department of Art Research, Archives, and Information Systems on May 28 of last year. On May 29, SHIRONO Seiji and KOBAYASHI Tatsuro participated in a study involving macro-photography of the “Backboard” Mandala in Taima-dera Temple’s mandala hall. Portions of the original figured brocade on the Mandala “Imprint on Paper” were not readily discernible, but the fabric itself was found to remain. Because of the physical constraints on site, the scope of the study of the “Backboard” Mandala was somewhat limited, but the original figured brocade was found to have survived. The Taima Mandala was poorly understood, but the current study has helped to ascertain its true state. Following events in April, Mr. Chae Won LEE of South Korea’s National Research Institute of Cultural Heritage visited Japan as part of Research Exchanges between Japan and South Korea in relation to the Safeguarding and Preservation of Intangible Cultural Heritage. Mr. LEE studied selected conservation techniques, which are techniques for conservation of cultural properties. The Village of Showa, Fukushima Prefecture grows ramie (Boehmeria nivea) and extracts its fiber to supply the material to make Ojiya crepe and Echigo linen, which are important intangible cultural properties. 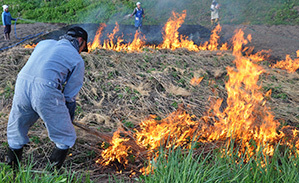 The study coincided with karamushi-yaki, or burning off of brush to prepare fields to grow ramie during shoman (the 8th of 24 solar terms in the traditional Japanese calendar when crops ripen/bloom around May 21st or so). This coincidence allowed Mr. LEE to see an important growing process firsthand. In addition, group interviews regarding ramie were conducted to hear the perspectives of administrators and conservators and the perspectives of others, facilitating a more extensive discussion of the significance of ramie growing to the Village of Showa and systems to conserve selected conservation techniques. Results of the research exchanges, which lasted 2 weeks, were presented at a seminar that highlighted differences in Japanese and Korean perceptions of Selected Conservation Techniques (no such framework exists in South Korea). The seminar also highlighted ways to safeguard cultural properties. 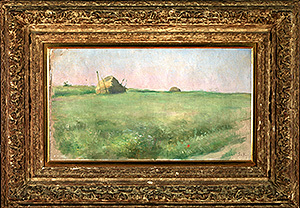 The Center for Conservation Science and Restoration Techniques has studied the conservation of cultural properties outdoors as part of Research on the Effects of Environmental Pollution on Cultural Properties and the Development of Restoration Techniques. This international research project has been conducted jointly with the National Research Institute of Cultural Heritage, South Korea. As part of the project, seminars are held annually by both institutions so that researchers from both countries can interact more closely with their counterparts. This year, a seminar was held on May 21 (Tues.) in a basement meeting room at the National Research Institute for Cultural Properties, Tokyo. Presentations were given by 4 personnel from the National Research Institute of Cultural Heritage, South Korea: Sa Dug KIM, Sun Myung LEE, Tae Jong LEE, and Yu Gun CHUN. Presentations were also given by KUCHITSU Nobuaki, NAKAYAMA Shunsuke , and MORII Masayuki of the National Research Institute for Cultural Properties, Tokyo. The conservation of cultural properties outdoors was discussed. The following day, a joint survey was conducted in Hokkaido. The status of the display and conservation of petroglyphs in the Fugoppe Cave (Town of Yoichi) and Temiya Cave (City of Otaru) was studied. Conservation of the Bangudae Petroglyphs in Ulsan is a current topic in South Korea. 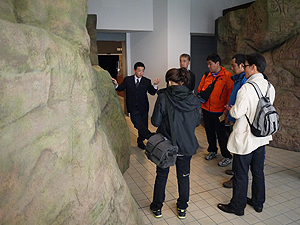 Korean researchers asked numerous questions about topics such as display lighting and facilities maintenance. The conservation of petroglyphs in Japan proved informative.